Men, by nature, aren’t the most vocal when it comes to proposals, engagements, and settling down. Unlike girls, who share Pinterest wedding boards with their mothers and BFFs, fill up Viber groups with talks of finding the perfect gown, and gossip about their sworn enemy from high school’s boulder of a ring, guys tend to be pretty low-key. How long have you been in a relationship? Nine years. Do you have plans of proposing in the near future? Yes. How much do guys actually think of proposing or settling down? In my opinion, when you've found, or think you've found, the right girl, then it's inevitable that you actually think of proposing and/or settling down. There’s a belief that guys should spend three months’ worth of their salary for an engagement ring. What do you think of this? To each his own, I guess, but I'm willing to spend more for someone I love, and who has been with me through thick and thin. You can always earn the money back, but you can't recover the moment if it passes. How much would you actually be willing to spend? Definitely more than three times my salary. How do you plan to save, or what have you been doing to save for the ring? I invested a certain amount in bonds, and I plan to wait for it to grow in the hope that when the time is right, I would have the amount I need. Have you done any kind of research or asked for any kind of help? I've asked my friends who plan to get married soon. Do you think women make too big of a deal about engagement rings? I don't think women make too big of a deal about engagement rings. Obviously, there are some women who will go over the top and make unreasonable demands (unreasonable under the circumstances). In any case, for me, and as a general rule, it's something the right woman deserves. I am currently on a seven-month relationship (and going strong! ), but the longest relationship I had was with my first girlfriend, which lasted for nine years. Do you have plans of proposing in the near future? Yes, in two to three years. I think it has a lot more to do with age or maturity and current priorities in life. For someone who has a clear vision and set priorities in life, then yes, he will be thinking a lot about how and when he will propose and even settle down. Having clear and set priorities compels you to have a concrete plan on how to go about your goals in life. I do not necessarily subscribe into that idea. I’ve been making my own money for a while already, and I know that one should always live within his means—but, of course, on special occasions (a once-in-a-lifetime one, at that! ), you may want to extend your budget a little more. Yes, I am willing to spend three months’ worth of salary for a ring, but I probably would have to cut it down and reallocate some of those funds for the wedding instead. How much would you actually be willing to spend? Currently, I am comfortable to spend up to one to two months’ worth. I have been trimming excess fat in my expenditures—which means I should always make it a point to carefully assess my expenses. I should never buy things that I only want, but I actually do not need. Secondly, I have been reallocating my savings into investments, such as bonds, to supplement my income. I have a couple of colleagues who recently got engaged and married, so yes, you can say I kind of did my research on engagement rings (and even the wedding!) through their experiences. I was even able to secure their budget plan and their actual expenses, which I think is going to be very useful, as it gives me real-life samples on the expenses I may soon face. Do you think women make too big of a deal about engagement rings? Why or why not? I think yes—women make too big of a deal about engagement rings more than men, but not to a fault. It is actually very endearing, knowing that the person you love the most is very excited and looking forward to the ring you will give her as a sign of your commitment. As long as the excitement is actually about The Meaning of the ring and not about the vanity any jewelry brings, then by all means, my future bride deserves to make a big deal about it. How long have you been in a relationship? Three years. Do you have plans of proposing in the near future? No. Sa kaso ko, napag-iisipan naman paminsan-minsan! With my first two relationships, we established pretty much off the bat that we were perfect for each other and that we would be together forever, so wedding plans were already discussed early on. I made a promise to myself that I wouldn't be in such a rush with my present relationship, but happily for the both of us, it's popped up from time to time. Nothing concrete, though. There’s a belief that guys should spend 3 months’ worth of their salary for an engagement ring. What do you think of this? I know I'll come off as a hypocrite; I'm answering this email interview on a laptop made with minerals dug up under horrible labor conditions, while wearing clothes probably made in a Southeast Asian sweatshop. But diamonds are a particularly egregious luxury that come at a terrible human cost. I would avoid spending this much money for this industry as much as I can. My mother passed away a few years back, and bequeathed a beautiful ring. It would be a great heirloom to pass on to future generations, should there be any. I would probably have the stone reset on a new band. Mas mag-iipon ako ng pera para sa pagkain ng mga bisita sa kasal. General savings tactics lang... Wala naman akong special "wedding fund" kasi wala namang plano. Have you done any kind of research or asked for any kind of help? No. Yes. Nasa tao naman iyan, hindi sa bato. How long have you been in a relationship? A year. Do you have plans of proposing in the near future? Of course! We talk about it from time to time, but we want to focus on our baby first and foremost. I’m more of a practical person; I would say one and a half to two months’ worth max. There’s a lot you can do with the money (such as save for retirement, insurance, education, etc.). I’m planning to create a separate fund that’s a secret from my SO, since we’re already transparent with our finances. Not yet, but my SO has shown me some examples. 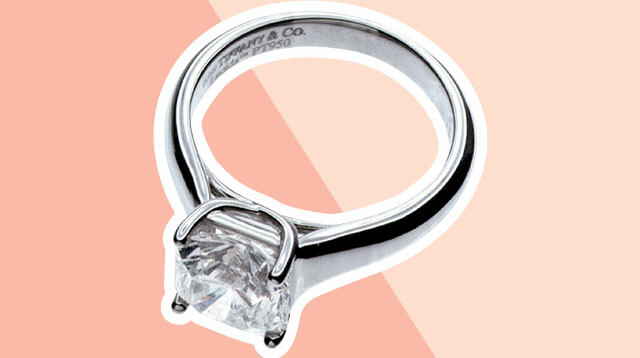 Do you think women make too big of a deal on engagement rings? Why or why not? Rings, I think, is a sign for them that this is it, the biggest commitment they will ever make in their lives, so that’s why it’s a big deal for them. How long have you been in a relationship? Over two years. I think about settling down a lot, because I know I’m with the girl I want to be with for the rest of my life. Yeah, that’s fine. Guys could spend more than that if they can. At least three months’ worth; more, if I can! Putting aside extra income earned through my other ventures. Just some research so far. Yes, because it really is a big deal. Being engaged is a game-changing event, and the ring is a symbol of the love that a man has for his woman.